This entry was posted in Regency, Uncategorized and tagged Barbara Villiers, Bridgewater House, Catherine of Braganza, Charles II, Cleveland Square, Duchess of Cleveland, Duke of Bridgewater by Angelyn. Bookmark the permalink. Angelyn, I love reading about all these wonderful houses and their histories. So said it was bombed. I’m glad you enjoy reading about them. Bridgewater House was made into an office building after WWII, but subsequently purchased by a Greek shipping tycoon whose family still makes it their private residence. So sad. Another beautiful house gone. See above reply–I ran out of gas at the end of the post and left off what happened to the house. Thanks for stopping by, Ally! 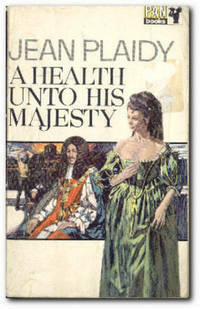 I read the Plaidy book and saw the Rufus Sewell version of CharlesII. Both made this period come alive for me. Loved this post! When I was in seventh grade, I remember seeing old postcards of various London buildings, which were bombed during WWII. So sad! Boy, what I wouldn’t give to see those postcards now. Thanks for stopping by! Pleased to let you know that Bridgewater House was fully restored back to its Victorian glory , the restoration work started in1982, and took ten years to complete. 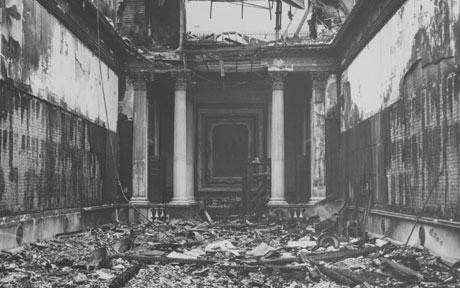 Some images of the interior are available on Google images, The picture above was of the Bridgewater gallery that was damaged by a bomb in WW2, this was never restored, but is now a modern working office. So very pleased you have confirmed what we’ve hoped, Mr. Kelly. The tunnel uncovered is intriguing. Many thanks for your helpful comments.